Makita has added a new 3/8" crown stapler to its 18 volt LXT Lithium-Ion line. The new BST221 was designed for a wide rage of tasks, including furniture, upholstery, roofing, wrap, etc. The BST221 can drive 1/4", 3/8", 1/2", 9/16", 5/8", 3/4", and 7/8" length staples (3/8" crown); and will also utilize Arrow® T50 type staples. Makita also says the stapler has enough power to drive staples flush into hardwoods like oak, maple, and cherry. It weighs in at 5.1 pounds at just 9-7/8" long, and is available as a Kit (BST221) with 2 batteries, charger, safety glasses, belt clip, and a contractor bag for MSRP $469, and as Tool Only (BST221Z) MSRP $289. Of course the actual street price should be less. This new stapler brings Makita's 18 volt LXT line to 35 tools, and they say more are on the way. So what tools could be next? My guess would be some cordless nail guns that would compete with the DeWalt line. 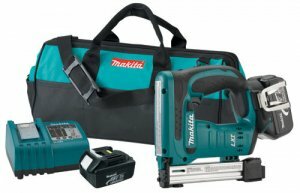 What cordless tools do you want Makita to make?